If you love floral design jewelry, this designer flower wedding band ring in white gold from Apples of Gold Jewelry is sure to be a wedding ring that will brighten up your day. The upbeat and fun floral design, which features highly detailed flowers and leaves, goes around your choice of a 14K or 18K white gold wedding band. The band has a comfort fit curve on the inside to add extra comfort to those wearing the ring, which is shown here in a 7mm width. 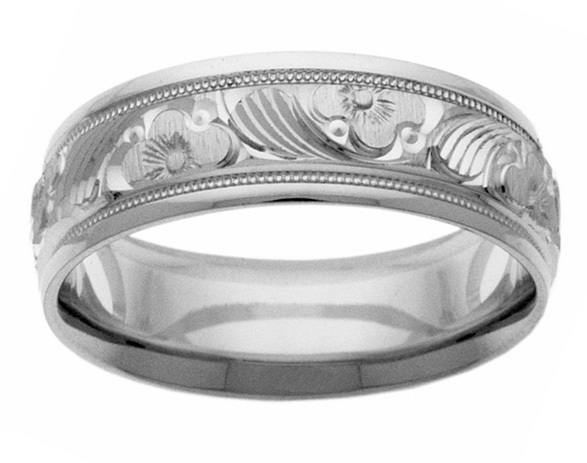 This white gold flower band is also available in widths of 5mm-8mm, and is ideal for both men and women. We guarantee our Designer Flower Wedding Band Ring in White Gold to be high quality, authentic jewelry, as described above.